Yesterday, New York had its first transit strike in 25 years. On a cold afternoon I started walking to work, from Brooklyn to Manhattan. I walked through places I had never visited before, and got some cool photos; the sky was clear and cold (really cold), on the last day of autumn. 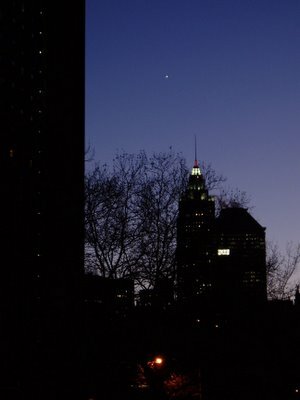 Here is Venus above the American International Building (the third tallest building in New York), as seen from Chinatown.